Skills and abilities: He has various martial arts and hand to hand training experience gained from his time as a mercenary and soldier. He speaks multiple languages and has experience with a variety of weapons. Powers:Artificially enhanced physiology at the absolute peak of human strength, speed, agility, dexterity, reflexes/reactions, coordination, balance, and endurance. In addition to this he wields his fathers Triangular Shield and wear chain mail armor. Josiah was born from the altered genetic material of Isiah Bradley and his wife Faith but grown in a surrogate mother. 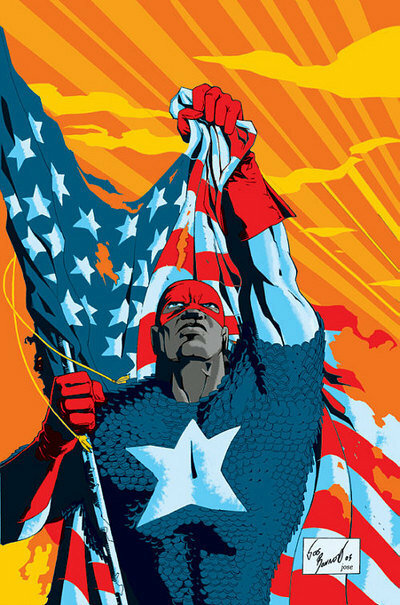 The government planned to grow the perfect soldier to be used as a personal unthinking weapon, essentially a controlled Captain America or Isiah Bradley. During his conception a more stable peak human gene was developed within him making him more powerful than previous super soldiers. His surrogate mother fled from the US government and later gave birth to Josiah and left him at a catholic orphanage. He remained here until he was a teenager when his powers manifested where he lashed out at one of the nuns. Thinking her dead he fled and joined the military. He served many tours during the Vietnam war. His unit was all black and received allot of racist flack as a result. When his unit was almost bombed along with a village he almost beat his commanding officer to death which got him a court marshal and jail time in a military prison. An unsanctioned blood test revealed that eh was the missing “super soldier baby”. His surrogate mother again helped him to escape and revealed the identity of his real parents to him. He evaded the military for the next four years before finally meeting his biological parents. Unable to guarantee their safety if he stayed he traveled to Africa as a mercenary. It was in Africa that he discovered the faith of Islam. Returning to the united states he opened a Muslim mission and changed his last name to X symbolizing his allegiance to the Lost Tribe of Shabazz. It was here he met up with Kasper Cole and War Machine and made the super team “The Crew”. After their adventures he appears to have gone missing once more [The Crew 1-7].